I suppose a definition of 'elf plane' is in order. The term came about as I was explaining how they work to my kids. I showed them a jack plane and explained that each little piece on the microplane was like a little elf holding one. So, naturally, it was christened the elf plane. Now I have Jack, Block, Smoother, Jointer, and Elf planes. Highland woodworking had a sale on Iwasaki files a while back and I picked up my first two. Though they are billed as files, these things are really rasps. Good rasps. Above is a picture of my latest microplane and the Iwasaki flat rile/rasp. 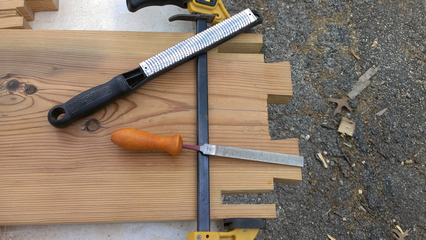 The mortise being worked on is for a replica of a 15th century bench. Note for a second the 'V' nature of the tenons. The mortise they go into is the same size as the base. The tenon is compressed with clamps and inserted into the mortise; the expansion of the wood then holds the bench together. The rasp fits tight spaces like this far better than the microplane. The rasp also has a true flat surface to reference itself against; the microplane has a slight curve across it's face. Here is a closeup of one of the stretcher mortises. The work with the tool is almost complete in this photo. 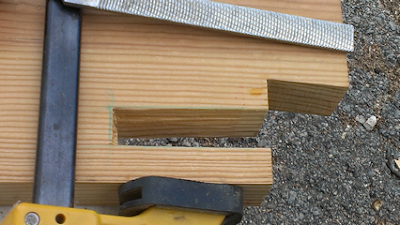 The clamp is on with the barest of pressure due to it's job being prevention of breaking the narrow strip of wood on the outside. I probably could have worded that better, but it is late. EDIT: I really must have been tired last night as I left off the whole last paragraph somehow. I am now convinced of the superiority of a quality rasp after my experience with the Iwasaki files. The cut of the wood is more controlled. The durability of the medium and flexibility of the thinner profile enable a wider variety of uses at various stages of a project. I am not getting rid of the elf plane as they are just too darn useful for hogging off wood. Besides, you just never know when you may need some grated cheese or lemon zest while working in the wood shop.